The Intracycle is a physical game- I mean- interdimensional vehicle, that allows you to explore the minds of others. In particular, the minds of previous users. It is crudely constructed from pipes, wood, a bicycle wheel, ideas, duct tape, etc. The world premier of The Intracycle took place on March 29th, 2018, at an art gallery called Babycastles in New York City, for the Glorious Trainwrecks x Babycastles exhibit. The main body of The Intracycle is surrounded by various objects important to the operation of the machine. There is a table, called the backseat table, which holds blank index cards, pencils, and a pencil sharpener. There is a box full of binder rings on the ground. There are posters advertising The Intracycle sitting on music stands. 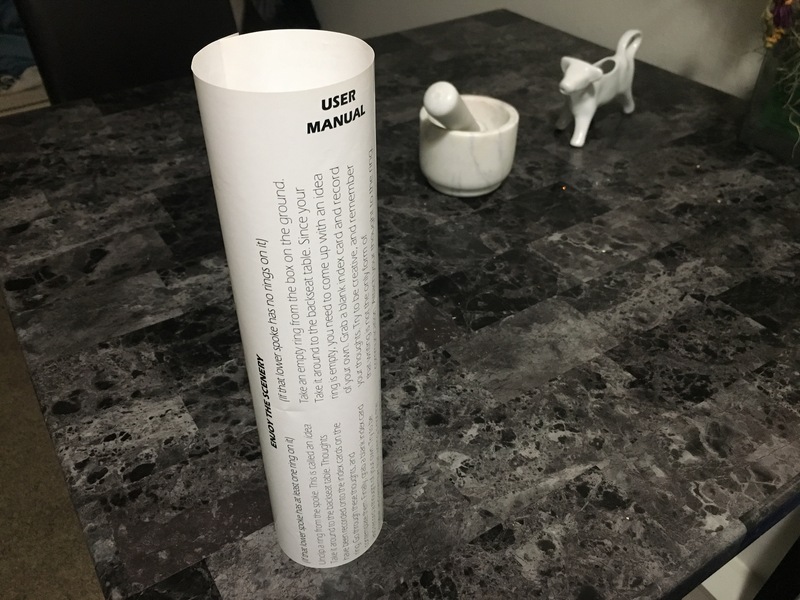 Also conveniently strewn around are user manuals, printed on cylinders of paper, explaining the intended operation of The Intracycle. The main body itself is a 6 foot tall frame of wood and pipes. Suspended from the roof of The Intracycle is a horizontal bicycle wheel which freely spins in place. Also fixed to the roof is a playing card, which slaps against the bicycle wheel as it spins, and acts analogous to a flapper on a prize wheel. 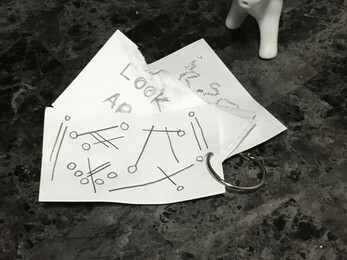 There are binder rings attached to the spokes of the bicycle wheel, and index cards attached to the rings. A ring along with its collection of index cards is called an idea. Furthermore, suspended from the center of the bicycle wheel is another ring, which acts as a home for finished ideas. When a user approaches the vehicle, the posters will inform them to refer to the “Take the driver’s seat” section of the user manual, and the user manual will guide them through the remainder of their trip. 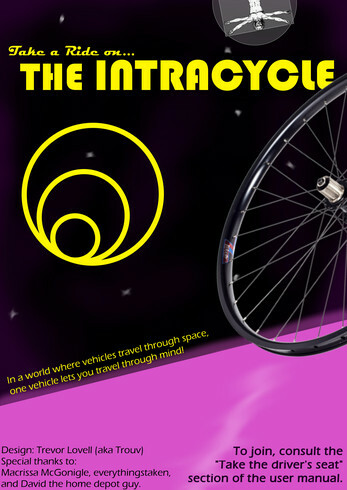 First, they spin the bicycle wheel, and the ideas attached to it will flourish out due to centripetal force. When it stops, the playing card will point to a spoke. Then, the user will take an idea from the spoke, or if there are none available, grab a binder ring from the box. They will consider all of the index cards already attached to their ring, and then record their own thoughts on another index card and attach it to the ring. They then return the idea to the bicycle wheel on whatever spoke the card is currently pointing to (or, if the idea has 12 or more cards on it, they will attach it to the center ring). From here, they repeat the process forever. More rigorous instructions are given on the user manual, which is printed on a cylinder to create the cyclic nature of the operation. 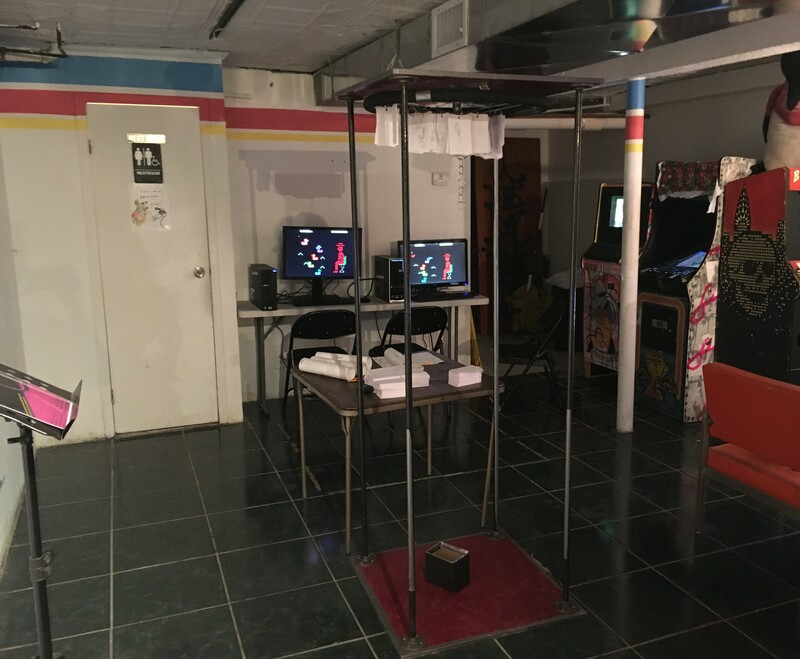 Currently, The Intracycle is not available at any art gallery, and hasn’t been since the Glorious Trainwrecks x Babycastles exhibit ended. However, it will return in the future, somewhere.